For months now – nay, years – the news on 401(k) support from Washington has been mixed at best, dismal at worst. Why, then, does today’s announcement out of Charlotte, NC, from the White House leave us feeling hopeful and excited? Based on the idea that employers can offer a qualified 401(k) retirement plan sponsored by an outside entity that bears responsibility for administering the plan, The Open MEP® from TAG Resources offers a leveraged solution to the very groups (small business) that need it most. 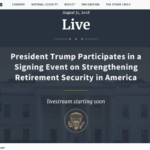 Although the retirement industry has had White House interest before, most recently from President Barack Obama in 2016, this announcement is like pushing a reset button and gives the current Republican-held administration and congress incentive to pass a bi-partisan bill that benefits small business owners, gig economy workers, and help to repair the retirement crisis in America. In the President’s State of the Union address in January 2018, Trump touted gains in 401(k) plans, but most workers don’t have one. At companies that offer 401(k) plans, less than half of employees participate according to data analyzed by The Pew Charitable Trusts. Additionally, this study found that 35 percent of private sector workers over the age of 22 don’t work for a company that offers a plan. And the numbers were more stark for younger people. Pew found that 41 percent of millennials didn’t have access to an employer-sponsored retirement plan while only 35 percent of Gen-X and 30 percent of boomers had to do without. In another study, only about one-third of workers participate in a 401(k) plan, according to 2017 research from the U.S. Census Bureau. In fact, just 14 percent of all employers have a 401(k) or other defined contribution plan for their workers. Even at companies where they are offered, only 41 percent of employees contribute. Among small businesses, it’s likely that a 401(k) is not even available. In 2018 TAG Resources representatives, Troy Tisue and Derren Burrell, traveled to Washington on separate occasions joining other retirement industry leaders in discussions with key congressional committees about expanding the options available to employers through alternatives such as The Open MEP®. It looks like the long wait might finally be over.